DO-17040-12 was succesfully added to your cart. All measurements reported are traceable to SI units via national standards maintained by NIST and performed in compliance with ANSI Z540, ISO17025, and MIL-STD-45662A. InnoCal is accredited to ISO/IEC 17025 by the American Association for Laboratory Accreditation (A2LA) under certificate number 1746.01. This accreditation is your assurance that the calibration is performed in a qualified, controlled laboratory.Calibrations on pressure and vacuum gauges are performed using direct comparison against ultra-precise quartz reference transducers. Pressure measurements can be taken up to 20,000 psi and vacuum measurements down to 29.2 inches of Mercury. The calibration consists of 10 points upscale and 10 points downscale across the range of the instrument. This is for a NIST calibration service for pressure/vacuum gauges. You can use this to calibrate the Accu-cal Plus but it is not included. If you have a question in regards to a specific product please contact our technical application specialists for additional assistance (contact information can be found in the "contact us" section on the web page). do i need to calibrate the pressure gauges regularly ? how often do i need to do that? Can you do both of these instruments? The Heise pressure calibrator uses a different calibration service, please see part number 17002-15. The Ashcroft gauge could be calibrated under this service though. Please contact our return specialists to set up a service return so Innocal may calibrate the units. Contact information may be found under the "Contact/About Us" tab. We have lots of WIKA digital low pressure gauges (30"Hg to 29psi) installed in our measuring equipments. After using for while, the gauge needs to calibrate and verify. Would you please recommend the calibration procedure and calibration devices? If the gauge is still in calibration period, how can I verify it? Again please recommend verification procedure and devices? We cannot recommend a calibration schedule. The schedule is generally based upon the regulations and governing bodies you must follow. Without asking for any alterations, this calibration service, and certificate, have an expiration date of one year. would I receive the actual calibration data for the unit? Yes, you will receive a calibration report that includes test data. 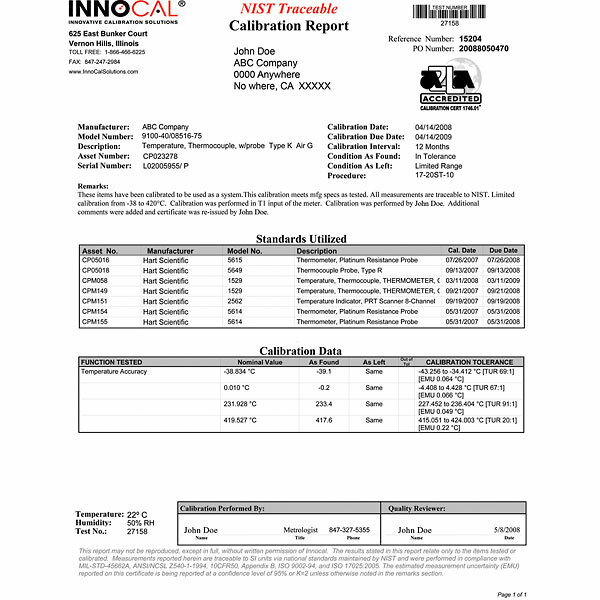 This report will include a description and identification of the item, condition of the item as received, identification of calibration procedure, calibration date, as found/as left test data, electronic signature of technician, statement of estimated uncertainty, test uncertainties (TURs), and a list of standards used to perform calibration (including their calibration dates). First time using Innocal. Miscommunication with test points needed on the certification and issue was immediately addressed and item was sent back, redone and returned in a timely manner. Loved the customer service and lab technician ability to respond so quickly and address my issue. Will defiantly use them again. Calibration was way to long 87 days! Gage work well, but was sent in to Davis Instrumentd for calibration and took 87 days before we got it back. Gave a different reason everytime we called as to what was to hold up. "Not a 17025 Accredited Cert"
If you are required to have a 17025 Accredited Cert you have to pay a $60.00 up charge for the A2LA Logo. This would be ok if they didn't specifically point the logo out on the example of a NIST Traceable calibration report and if they listed the option of the accredited cert below this one. We use the NIST calibrated equipment to check other devices inhouse.